Or, Thompson and Walker approach long term care redesign in entirely different ways – A tale of then vs now. Governor Walker’s proposed Wisconsin budget for the 2015-2017 biennium contains a major overhaul of the Family Care System. This proposal blindsided the vast majority of organizations who work with seniors and disabled individuals. It came as a complete surprise because Walker had not consulted with any stakeholders prior to proposing this overhaul. This is nothing new for Walker, who is not exactly known for having a cooperative approach on reforming laws and services for the less-than-wealthy. Walker prefers the ramrod approach. But it is new for those of us in the elder and disability community, because here in our world we have a history of coming to the table to discuss these things. This approach was put in place by a prior Republican governor, Tommy Thompson. Before I get in to the historical background, let me briefly explain Family Care. It is Wisconsin’s community long term care program for elderly and disabled individuals. Family Care is a program that is operated through the federal Medicaid Waiver program. This means the program gets Medicaid funding and follows many of Medicaid’s rules. Family Care provides services to people who, because of their medical conditions, need help and support to stay in their homes or in a community setting such as assisted living, a group home or a supervised apartment. Many of my elderly clients who live in assisted living facilities are able to qualify for this program. Others are able to pay for services coming into their home to help with things like medication management, bathing and transportation. Programs like Family Care are mandatory as a result of cases like the Olmstead decision in the United States Supreme Court, that found a state violated disability discrimination rules when it had long waiting lists for community care that forced people to receive care in an institution when a less restrictive setting would be appropriate. Which brings me to the history of Family Care. Years ago, Wisconsin’s program to provide community-based long term care services was called the “Community Options Program” (and the Community Options Waiver Program). Although it was a good program for those who could get it, there were extremely long waiting lists and delays, so much so that the state and counties were being sued for discrimination and violations of federal laws. I was one of the attorneys representing elderly individuals on such a case. Governor Thompson, as well as the aging and disability community and the county governments, recognized the need for change. So in 1995, Governor Thompson convened a committee on Long Term Care Redesign to study the possibility for reworking the system to eliminate waiting lists. A history of this effort can be found here. The Redesign Committee worked for several years, formed subcommittees focused on certain issues, and held many stakeholder meetings. Family Care was born as a result. It was in Governor Thompson’s 1999-2001 budget proposal, the product of several years of study and the development of consensus among stakeholders. But when you are Scott Walker, who needs consensus? Walker’s redesign proposal would eliminate some important aspects of the program. First, it would eliminate the IRIS ( I Respect, I Self-direct) program, which allows participants to self-manage their own budget for their care, providing the widest latitude to create an individual program within a budget. Second, it would replace the Managed Care Organizations that operate in various districts to run the program. It would restrict participation in Family Care only to those MCOS that can operate on a statewide basis. This is NONE of the current MCOs. To operate statewide, an MCO would have to have significant capital, the kind that only large insurance programs have.Third, it transfers oversight of the MCOs to the Office of the Commissioner of Insurance instead of the Division of Health Services. Fourth, it provides a means to eliminate the current Aging and Disability Resource Centers that provide help on a local basis to seniors and disabled individuals, by allowing this service to be contracted out. There are numerous other changes proposed that are too many to go into here. You might ask, why the changes? Well, when you are Scott Walker, why not? He must have a good reason. Like, providing big business for out of state insurance companies and putting Wisconsin MCOs out of business. Reducing the size of government by eliminating the ADRCs. Or something like that. But definitely not improving services for elderly and disabled people. That is nowhere in this equation, or else he would have had them at the table in making the decision. Since its implementation, Family Care has eliminated waiting lists, reduced long term care costs, and increased the delivery of care and services. Is it perfect? No. Part of my job is to complain about the things that go wrong in that system. But it is effective. And changing it is something that should be done with careful consideration, not an iron Walker fist. March 18, Brillion High School, 10 a.m. – 5 p.m.
March 20, Alverno College, Milwaukee, 10 – 5. March 23, U.W. Barron County, Rice Lake 10 – 5. March 26, Reedsburg High School 9:30 – 4:00. It might be the only chance that consumers get to be part of the discussion. It seems certain we won’t get an invitation from Governor Walker. A New Jersey appeals court has refused to create a bright-line rule that says marriage creates a presumptive right for a spouse to receive the benefits of his or her partner’s life insurance benefits if the deceased previously had designated someone else as the beneficiary. A three-judge Appellate Division panel, in a Feb. 24 published decision in Fox v. Lincoln Financial Group, said the creation of any such presumptive right would have to come from the Legislature. The ruling involves a Brazilian national, Evanisa Fox, who married a Morris County, New Jersey, man, Michael Fox, in July 2012, according to the opinion. He previously had been married to another woman, identified in the ruling only as Gail. Fox, a truck driver, had a life insurance policy through his employer that was worth about $100,000, the opinion said. After his divorce from Gail, Fox in 1996 designated his sister, Mary Ellen Scarpone, as the sole beneficiary of his policy. After Michael Fox and Evanisa Fox married, he began taking steps to have her become a naturalized citizen, including signing a federal immigration form guaranteeing that he would support her at 125 percent of the poverty level, the opinion said. He did nothing, however, toward changing the beneficiary of the life insurance policy from his sister to his new wife before he died in an accident on Nov. 9, 2012. After his death, Evanisa Fox filed a claim against Scarpone and Lincoln Financial Group, which issued the policy, for the life insurance funds, saying it would be “‘extremely difficult for me to survive without his support,’” the opinion said. Scarpone challenged the claim. Superior Court Judge Stephan Hansbury dismissed Evanisa’s claim, saying there was no statutory basis to change the beneficiary of a life insurance policy merely because of marriage, absent some affirmative effort to do so by the policyholder before death. Evanisa Fox appealed, asking the Appellate Division to create a bright-line rule that a spouse has a presumptive right to a partner’s life insurance policies, even if someone else is the named beneficiary. “We reject Evanisa’s broad public policy argument, and hold that her marriage to Michael, without more, is insufficient to defeat Scarpone’s beneficiary status,” Appellate Division Judge Harry Carroll said. Judges Carmen Alvarez and Alexander Waugh Jr. joined in the ruling. The appeals court refused to make that change in the law. “We decline to do so, and would instead leave so drastic a change to the Legislature,” Carroll said. Carroll noted that the Legislature enacted N.J.S.A. 3B:3-14, which provides that divorce automatically revokes a disposition of property made by a divorced spouse to his or her former partner in a “governing instrument,” which he said by definition includes an insurance policy. “It could similarly pass legislation granting presumptive beneficiary rights to a spouse upon marriage should it determine to do so,” Carroll said. Also, Carroll said lawmakers enacted N.J.S.A. 3B:5-15, which provides an intestate share to a surviving spouse unintentionally omitted from a premarital will because of the presumption that the spouse who wrote the will intended to provide for the spouse. That statute, however, does not cover non-probate assets, such as life insurance policies, Carroll said. Evanisa Fox argued on appeal that a ruling in her favor would be a logical extension of the state Supreme Court’s 1991 ruling in Vasconi v. Guardian Life Insurance Co. In that case, the court ruled that there is a presumption that a divorced spouse should no longer be the beneficiary of a deceased ex-spouse’s life insurance benefits, even if he or she was still listed as the beneficiary. Evanisa Fox argued that the case could also be an extension of the Appellate Division’s 1993 ruling in DeCeglia v. Estate of Colletti. That case involved a man who had named his mother and sister as beneficiaries of several life insurance policies. After his live-in girlfriend became pregnant, according to court documents, the man discussed with a lawyer and his insurance agent naming his girlfriend as the beneficiary to ensure that his child would be taken care of. He unexpectedly died, however, before actually changing the beneficiary. The appeals court ruled in the girlfriend’s favor, saying her boyfriend intended to change the beneficiary. There was no such evidence of intent in this case, Carroll said. Evanisa Fox’s attorney is Morristown, New Jersey, solo Michael Patrick Carroll—no relation to the judge—who is also a Republican assemblyman from Morris County. He said he will ask the state Supreme Court to hear an appeal. “This is one of those rare cases where it would have been O.K. for the courts to legislate from the bench,” he said, adding that he will not use his position as a legislator to push for a change in the statutes. It is not proper to sponsor legislation that would benefit a client, he said. “Even though I wouldn’t benefit, it would look kind of cheesy,” he said. Scarpone’s attorney, Benjamin Kurtis, said the appeals court made the correct call. This article appeared in the New Jersey Law Journal on February 26, 2015. My mother Velma was complex and our relationship was complicated. Like many women of her generation, she took a job during World War II. As a chemistry major in college, she worked in a plant that developed therapeutic uses for penicillin. She had to give it up when the war ended. She continued in college and met my father Russell after he returned from duty in the Navy. They married and she finished school at the same time she was caring for my oldest brother as a newborn. As a child growing up, Mom was the driving force in our lives. My father, having been on the road for many years as a traveling textbook salesman, settled in the background in a supporting role, taking charge mostly when travel, our Canadian cottage, or cars, repairs or logistics were involved. Mom always had papers moving around. When I was a small child, she was writing her Master’s thesis, although I didn’t know it at the time. To me she was just spending a lot of time at the typewriter. As I grew up, she was typing letters to the editor, political com mentaries, letters to friends and seemingly always working on editing a paper for one of my brothers and later, me. Or campaigning for some issue of justice she felt needed to be addressed. She clipped newspaper and magazine articles and saved them for discussion among the family. Mom held strong opinions on issues of justice and injustice. We belonged to three different churches over the course of my life, because my mother took issue with either an action of the church (treating a woman minister unfairly in the Methodist Church) or a political position (our Lutheran church supporting a war my mother felt was wrong.) They settled on a UCC church that my parents remained active in until my father died, and which committed no political or administrative transgressions warranting its removal from their religious lives. Although she came from a Republican family, she was a Democrat her whole adult life. At times, my mom seemed to have a level of frustration with the limitations of her primary role as housewife and mother. She spent time as a substitute teacher and worked with homebound students, but never took a full time job. I wonder if she felt like she was never allowed to develop her full career potential. She was extremely bright. My mom was also an excellent cook. Growing up on a chicken farm, she made the best fried chicken ever. Her pie crusts were perfect and in Canada at our cottage, she could cook fresh fish six different ways at the drop of a hat. She had many other hobbies and interests. She loved the time she and my father spent together in Canada. While my mother was mostly a caring, loving woman when I was younger, she also had a temper that could become ugly, particularly when I or one of my brothers got out of line. When she would react with rage at some transgression, I sometimes wondered whether it was really me she was angry with, or something or someone else. Maybe her lack of control over me mirrored a lack of control over her life. I never learned the truth about that. Because I was a particularly rebellious young woman, I bore the brunt of a lot of my mom’s temper in my teens. Later, when my son Ken was a newborn, I saw an entirely different side – an entirely nurturing and happy woman caring for my little boy without the slightest hint of anger or discontent. She was a wonderful Grandma. It was in the late 1990’s when she was diagnosed with a rare type of abdominal cancer, Pseudomyxoma Peritonei. The doctors in Wisconsin gave her six months to live. I asked the doctor to tell me which type of this rare cancer my mother had (there were three types) and she refused to answer, simply insisting that my mother’s life expectancy was six months or less. We did not want to accept this determination, so I located a specialist in Washington DC. We flew there for a second opinion. Shortly afterward my mother had a complicated, long surgery for the cancer. She did extremely well and returned home much earlier than expected. She chose to fight, and she fought hard. She proved the Wisconsin doctors wrong, surviving over 15 years. Not quite two years after the surgery, we noticed the forgetfulness. Questions being repeated. Stories being retold. Losing track of what she had been doing. At first it was just annoying. We didn’t know what was going on, and it simply irritated us to answer questions over and over. Eventually, we became concerned. Mom and Dad continued on in their home, living independently for the next several years. I kept in touch with phone calls, church on Sunday, stopping for lunch or dinner, and holidays. The questions kept being repeated. Mom stopped driving on her own. More and more handwritten notes, lists and reminders appeared around the house. Important letters and bills had the words “SAVE” written in Mom’s handwriting, sometimes circled. Cooking became more difficult for Mom. One time, she put dish soap in the soup she was making, and became extremely humiliated and upset. Eventually, we stopped having holidays at my parents’ house and started having them at my house. On Thanksgiving, 2007, Mom and Dad came to my house for the holiday dinner. The next day, my father called asking me to take him to the emergency room. After seeing the doctor, it became clear he needed care for a bladder condition, and would need to stay at my house for the weekend, so I could monitor him. We returned home and picked up Mom, and they came to my house. I settled them in my bedroom for the weekend. They never left. My father had been spending so much time attending my mother, that he had neglected his own care. His treatable bladder condition had progressed to a point where it needed surgery that was only minimally helpful and ultimately, the cancer became fatal. In the course of evaluating my father, as they stayed at my house it became very clear that my mother’s dementia was progressed much farther than we realized. When we were only seeing her for a day, or talking on the phone, she was able to pull the wool over our eyes, albeit unintentionally. Because of her high level of intelligence, she was able to carry on a conversation for quite awhile (the repeated questions aside) and it was only when I compared her stories about her day with what I knew to be reality because she was living with me, that I realized she was relaying a life of fiction to us which she made up as she went along. Thus began our lives as caregivers for my mom and briefly, for my dad. 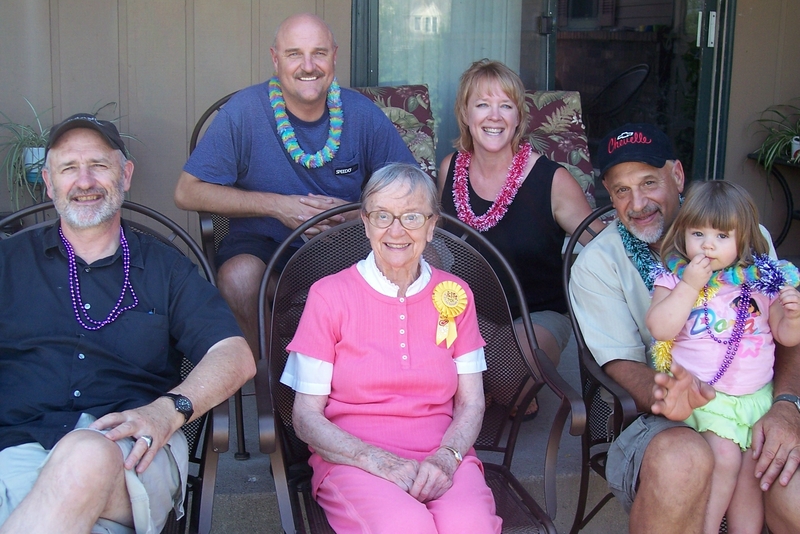 During the course of their illnesses, my three brothers and I took part in caring for my parents. My oldest brother Richard moved from his home in New Mexico to stay in my house with my parents while my dad was dying, because I had a full time job. My brothers Bob and Brad provided respite care and did other tasks to make our situation workable. 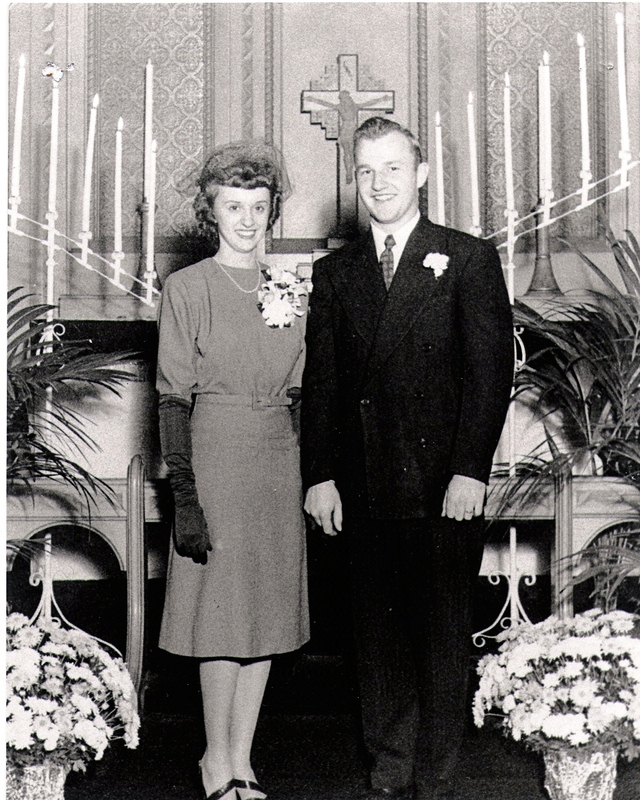 My parents were married for 61 years when my father died of cancer in June, 2008. At his funeral, my mother asked me, “Now, whose husband is that in the casket?” At the gravesite, when the military honor guard handed her the flag, she seemed to understand it was her dear Russell. After my father’s death began the quest to find high quality care for my mother. That, and the stories of our adventures and misadventures while Mom lived with me and in the three care facilities she experienced, are best saved for other posts. Throughout the course of her disease, we saw both the sweet and challenging, angry sides of my mother as she had always been. My mother’s dementia continued to deteriorate. By 2012, she no longer knew my brothers or I. We were simply nice people who came to visit. By 2014, she needed skilled care and we were fortunate to get her into Lasata Care Center in Cedarburg. At some point in the later stages of the disease, we started referring to “the Mom we knew.” The Mom we knew would never have wanted this, we would say. Somehow, we now had a new mom. This was the dementia mom. The dementia mom was not our “real” mom. We convinced ourselves that our “real” mom, the Mom we knew, was gone. This somehow made it ok that the “dementia mom” did not know us. It made it ok that “dementia mom” swore at her caregivers, and chewed on napkins thinking they were food or stole stuffed animals and pictures of someone else’s loved ones from other residents’ rooms. Our “real mom” never would have done those things, but it was ok for dementia mom. Eventually, the thoughts came that our “real mom” never would have wanted to be alive if she knew she had become the dementia mom, it would not have been something our “real mom” would have stood for, as beneath her dignity and fierce autonomy. But our real mom was not there to stand up for herself, so dementia mom continued to live in her own way. Of course we loved the dementia mom, it was just different. Then came the call, at 5:30 a.m. on Thursday, Jan. 15. “Your mother has had a change of condition,” said the nursing supervisor. This call was the beginning of the final stage of my mother’s disease. She had developed a high fever. It subsided after treatment, then came back the next day. My brothers Brad and Bob came down the following day, and then on a Sunday my mother lapsed into a state of not eating, not drinking, not responding. During the week that followed, we stayed with my mother as much as possible, taking shifts. 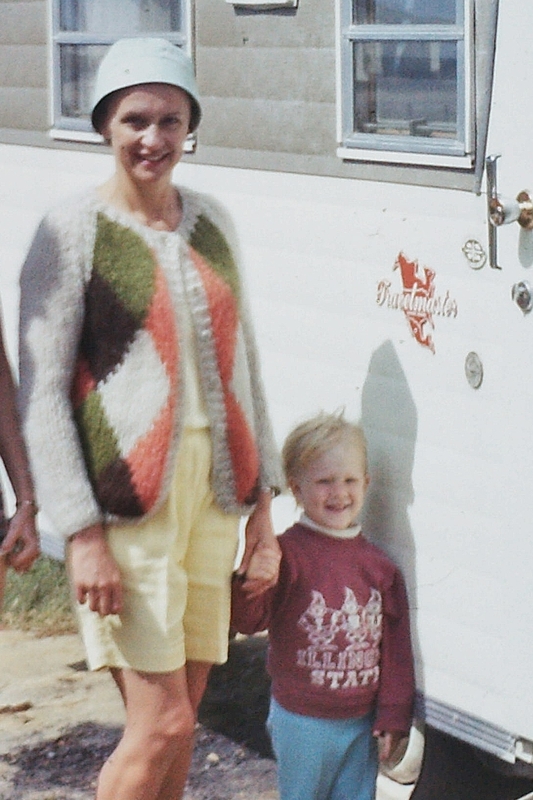 In those days I held my mother’s hand, rubbed her arms and feet, and played music. I put cold cloths on her head and put moist sponges in her mouth. I tried to sing to her and talk to her. I decided I should remind her about heaven, in case she had forgot. I cried and cried for the years we had lost. And in those hours and days, it occurred to me. This was my real Mom. This Mom lying on her bed, dying but still fighting. The dementia mom and the political mom, the Mom who didn’t know us and the Mom who raised us, the Mom who fought with her caregivers and the Mom who beat our behinds, the Mom who repeated questions and the Mom who wrote our papers, the Mom who was there when I was a little girl and the Mom who was there at the end when I felt so very, very old and tired. The Mom who lived, and the Mom who died on January 24, 2015 after a fifteen year battle with Dementia. I so dearly miss the Mom I knew. Bless you, Mom.